Got too much junk in your trunk? That won't be a problem with the new and improved Trunk Caddy! 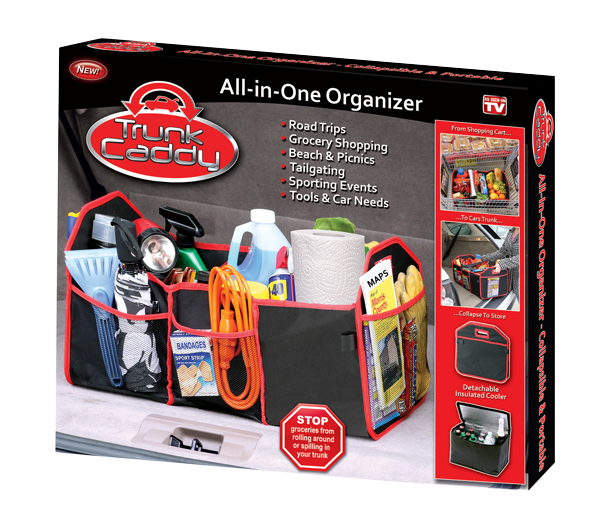 Trunk Caddy's pockets store all your items whether it's groceries, sports equipment, car care products or anything else. The new and improved tough oxford cotton fabric is tough enough for any job yet soft to the touch and easy to clean. The included extra hot and cold pouch fits into any of the large slots and can keep food hot or cold for hours, perfect for groceries or picnics.